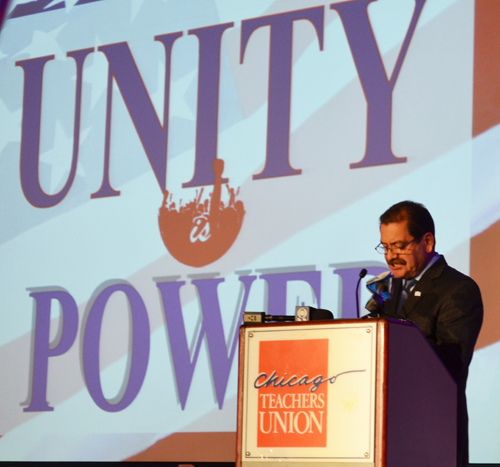 Cook County Commissioner Chuy Garcia speaking to the Chicago Teachers Union LEAD dinner on October 31, 2014. Substance photo by Sharon Schmidt.More than 1,000 participants in the annual Chicago Teachers Union's LEAD dinner learned on October 31, 2014 that the union's leadership is endorsing Cook County Commissioner Jesus "Chuy" Garcia for mayor. Garcia, whose candidacy was announced five days before the annual CTU event, was the keynote speaker before the crowd at the Plumbers Hall at 1340 W. Washington St. The theme of the LEAD (Legislators Educators Appreciation Dinner) was "Unity is Power." Others who spoke to the LEAD dinner included Interim CTU President Jesse Sharkey, who is leading the union in Lewis's absence, and Illinois Governor Pat Quinn, who had been listed as the union's featured speaker until the last-minute announcement about the Garcia endorsement. Additional speakers included Randi Weingarten, President of the American Federation of Teachers, and Congressman Danny Davis. CTU organizer Brandon Johnson MC'd the event. CHICAGO�In her first videotaped appearance since surgery earlier this month, CTU President Karen Lewis endorses Cook County Commissioner Jesus "Chuy" Garcia for mayor of Chicago. "Chuy is a committed and effective public servant, and has been for the last 30 years," Lewis said, calling Garcia a "consensus builder...who will work for all of our citizens." The Karen Lewis video endorsing Chuy Garcia was shown during the LEAD dinner. Substance photo by Sharon Schmidt.Garcia will be the keynote speaker at tonight's 2014 Legislators and Educators Appreciation Dinner. A 30-year veteran of Chicago politics, Garcia was elected to the Chicago City Council as alderman of the 22nd Ward in 1986, where he helped enact progressive legislation as a reformer and supporter of Mayor Harold Washington. In 1992, he became the first-ever Mexican-American elected to the Illinois Senate, where he served two terms and pushed forward a broad range of legislation to benefit working families. The "keynote" by Garcia came at the last minute. Earlier, Illinois Governor Pat Quinn was announced as the keynote. Other featured speakers in the earlier announcement were Randi Weingarten and Danny Davis. Rev. Jesse Jackson gave the invocation at the beginning of the event. 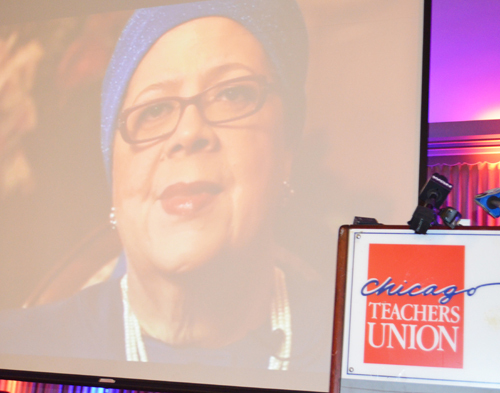 CHICAGO�Chicago Teachers Union (CTU) President Karen Lewis will be among the speakers at tonight�s 2014 Legislators and Educators Appreciation Dinner (LEAD) at Plumbers Hall, 1340 W. Washington Blvd. This annual event, organized by the CTU Political Action/Legislative Committee, provides an opportunity for rank and file members to engage elected officials and discuss the conditions in Chicago�s public schools and the Union�s fight for the city that Chicago�s students deserve. Cook County Commissioner Jesus �Chuy� Garcia will be the keynote speaker at 2014 LEAD. A 30-year veteran of Chicago politics, Garcia was elected to the Chicago City Council as alderman of the 22nd Ward in 1986, where he helped enact progressive legislation as a reformer and supporter of Mayor Harold Washington. In 1992, he became the first-ever Mexican-American elected to the Illinois Senate, where he served two terms and pushed forward a broad range of legislation to benefit working families. Among the speakers joining Garcia and President Lewis at 2014 LEAD are Illinois Governor Pat Quinn, American Federation of Teachers President Randi Weingarten and Congressman Danny Davis. WHO: Chicago Teachers Union active and retiree members, officers, administration and staff; community partners and allies; and elected officials. 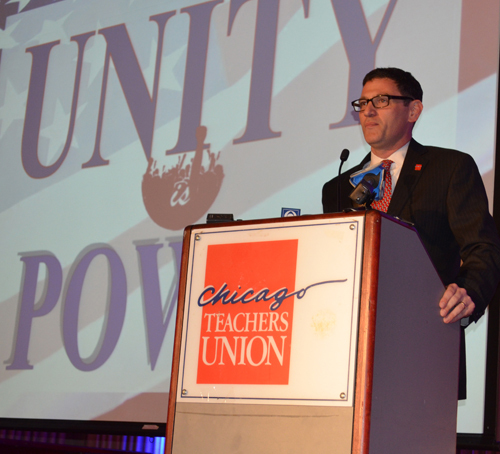 WHEN: Friday, October 31, 2014, at 5:30 p.m.
Acting Chicago Teachers Union President Jesse Sharkey introduced the speakers at the October 31 LEAD dinner. Substance photo by Sharon Schmidt.Two programs were distributed for the LEAD. The traditional program, "Unity Is Power," was in the format used by the union for the LEAD programs for decades. It included dozens of ads from supporters of the union. A second program indicating the cult of personality that is currently undermining democracy in the CTU less that five years after the upset election of the CORE slate headed by Karen Lewis (June 2010) was entitled "Tonight's Stars." "Tonight's Stars" featured promotional profiles of Jesus Chuy Garcia, Randi Weingarten, Danny Davis, Pat Quinn, Jacqueline Collins (a State Senator) and Emanuel "Chris" Welch (a State Rep). The "Stars" also included three teachers who had led a teacher boycott of the now-defunct ISAT test during the citywide parent Opt Out movement against the ISAT last year. Those "Anchor Awardees" were Sarah Chambers, Anne Carlson, and Juan Gonzalez. "Pioneer Awardees" were retired teachers Tom Lalagos and James Stewart. For the fourth year in a row, the PAC committee that determines who gets these awards continued the blacklist of the most prominent retiree leader of the anti-testing movement and within CORE and the union (this reporter). The irony of that blacklist is that by the time of the 2014 LEAD dinner, the CTU was endorsing a candidate for lieutenant governor (Paul Vallas, running with Pat Quinn; you can't vote "Quinn for Governor" without voting for Vallas) who had begun the blacklist in 1999 and 2000 with the infamous million dollar copyright infringement lawsuit against Substance. �Chuy is a committed and faithful public servant and has been for the last 30 years,� she said in which she addresses the camera straight on and in profile. The last "Star" listed in the program was Katelyn Johnson, who works with Action Now.